Holy Monday or Great and Holy Monday (Greek: Μεγάλη Δευτέρα, Megale Deutera) is the Monday of Holy Week, which is the week before Easter. It is the third day of Holy Week in Eastern Christianity, after Lazarus Saturday and Palm Sunday, and the second day of Holy Week in Western Christianity, after Palm Sunday. 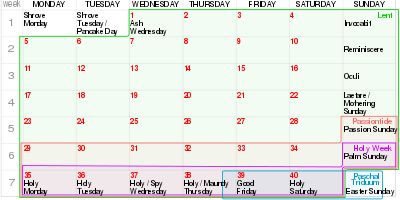 The Gospels tell us of some of the events that actually occurred on the day of the Biblical Holy Monday. Some of the most notable and recognizable of these were the cursing of the fig tree (Matthew 21:18-22, Mark 11:20-26), the questioning of Jesus' authority (Matthew 21:23-27), the Cleansing of the Temple and some diverse parables, depending on which Gospel is read. In the Revised Common Lectionary, which is used by the Anglican Communion, Methodist Churches, Lutheran Churches, Old Catholic Churches and Reformed Churches, the Scripture lessons are Isaiah 42:1-9 (First Reading), 36:5-11 (Psalm), Hebrews 9:11-15 (Second Reading), and John 12:1-9, (Gospel Reading). Grant, we beseech thee, almighty God, that we, who are in so many occasions of adversity, by reason of or frailty are found wanting, may yet, through the passion and intercession of thine only begotten Son, be continually refreshed; who liveth and reigneth with thee, in the unity of the Holy Spirit, world without end. Amen. Joseph sold into slavery by his brothers (Konstantin Flavitsky, 1855). In the Orthodox Church and those Eastern Catholic Churches that follow the Byzantine Rite, this day is referred to as Great and Holy Monday, or Great Monday. On this day the Church commemorates the withering of the fruitless fig tree (Matthew 21:18-22), a symbol of judgement that will befall those who do not bring forth the fruits of repentance. The hymns on this day also recall Joseph, the son of Jacob, whose innocent suffering at the hand of his brethren (Genesis 37), and false accusation (Genesis 39-40) are a type (foreshadowing) of the Passion of Christ. The day begins liturgically with Vespers on Palm Sunday night, repeating some of the same stichera (hymns) from the Praises of the All Night Vigil the evening before. At Small Compline a Triode (Canon composed of three Odes), written by St. Andrew of Crete is chanted. The Matins service for Monday through Wednesday of Holy Week is known as the Bridegroom Service or Bridegroom Prayer, because of their theme of Christ as the Bridegroom of the Church, a theme expressed in the troparion that is solemnly chanted near the beginning of the service. On these days, an icon of "Christ the Bridegroom" is placed on an analogion in the center of the temple, portraying Jesus wearing the purple robe of mockery and crowned with a crown of thorns (see Instruments of the Passion). The Matins Gospel read on this day is from the Gospel of Matthew 21:18-43). The canon at Matins has only three odes in it (a triode), and was composed by St. Cosmas of Maiuma. At the Liturgy of the Presanctified Gifts, some of the stichera from the previous night's Matins (Lauds and the Aposticha) are repeated at Lord, I have cried (see Vespers). There are two Old Testament readings: Exodus 1:1-20 and Job 1:1-12. There is no Epistle reading, but there is a Gospel reading from Matthew 24:3-35. ^ Holmes, Stephen Mark (1 October 2012). The Fathers on the Sunday Gospels. Liturgical Press. p. 22. ISBN 9780814635100. The Revised Common Lectionary has been subsequently adopted by many English-speaking Protestant denominations such as the Church of Scotland and various Methodist, Lutheran and Reformed Churches. It has also been adopted by some Old Catholic Churches and is widely used throughout the Anglican Communion, for example by the Church of Ireland, Scottish Episcopal Church, Church in Wales the Episcopal Church (USA) and the Anglican Churches of Canada, Australia, Aotearoa/New Zealand and Polynesia, Melanesia, the West Indies, Central Africa, and Southern Africa. In the Church of England the two-year Sunday Lectionary of the Alternative Service Book 1980 was replaced in 2000 by an adapted version of the Revised Common Lectionary in Common Worship. ^ "Year A - Holy Week : Revised Common Lectionary". Vanderbilt University Divinity School. Retrieved 22 March 2016. ^ a b Kallistos (Ware), Bishop (1978). Mary, Mother, ed. The Lenten Triodion. South Canaan, PA: St. Tikhon's Seminary Press. pp. 59–60. ISBN 978-1878997517. ^ Kallistos 1978, p. 518. Wikimedia Commons has media related to Holy Monday.